I knew I wasn't going to be able to blog every Iron Craft challenge I completed, but I will do my best to blog the big projects and some of my favourites. I'm so excited about the current craft challenge, but can't post a write up about it until reveal day (which is next week). I always find this kind of challenge difficult as I already do so many crafts!!! There's always more I want to try, but the cost &/or accessibility of materials usually gets in the way. So for this challenge I decided to use a new technique for something I already do... I blocked some items that I had crocheted. I am a self taught crocheter and never really thought I needed to block stuff - it seemed like an unnecessary additional step. It wasn't too much of a pain to do (except for rendering the dining table unusable for the duration), and I'll do it again - but not for every project. The challenges are obviously dreamed up in the Northern Hemisphere, because in my world it's more like dreading winter... I was running very short of time with this one too as I was busy making crafts for my kids' school gala as well as for the Little Sprouts Easter Country Fair. I decided that some of the badges I was making for these events looked a bit spring-like, so used them as my challenge entry. 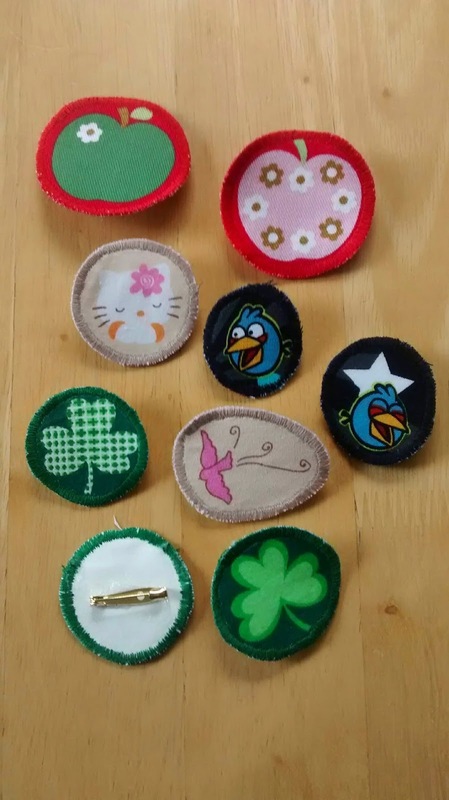 These badges were made in the same way as my key tags tutorial (found here), except they have a broach pin on the back instead of a ribbon & key ring. The reveal day for this challenge was on St Patrick's Day, and you'd think with my little Irish dancers in the house I would have done something Irish; but no. We're all pretty kitted out with St Patrick's Day stuff in this house, and I was still super busy with the gala & fair crafts, so I decided to make some of my gala baking green instead. 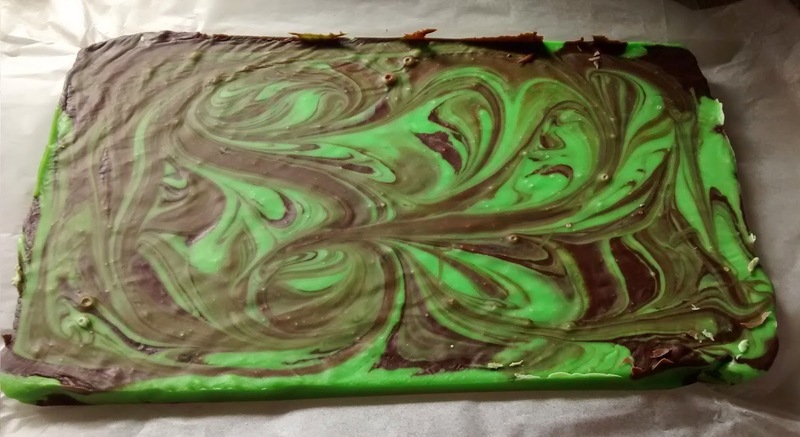 I made the little miss' absolute favourite peppermint fudge - which, surprise, surprise, is green. It's super easy to make and is sooooo yummy. And it looks cool too, if I do say so myself. 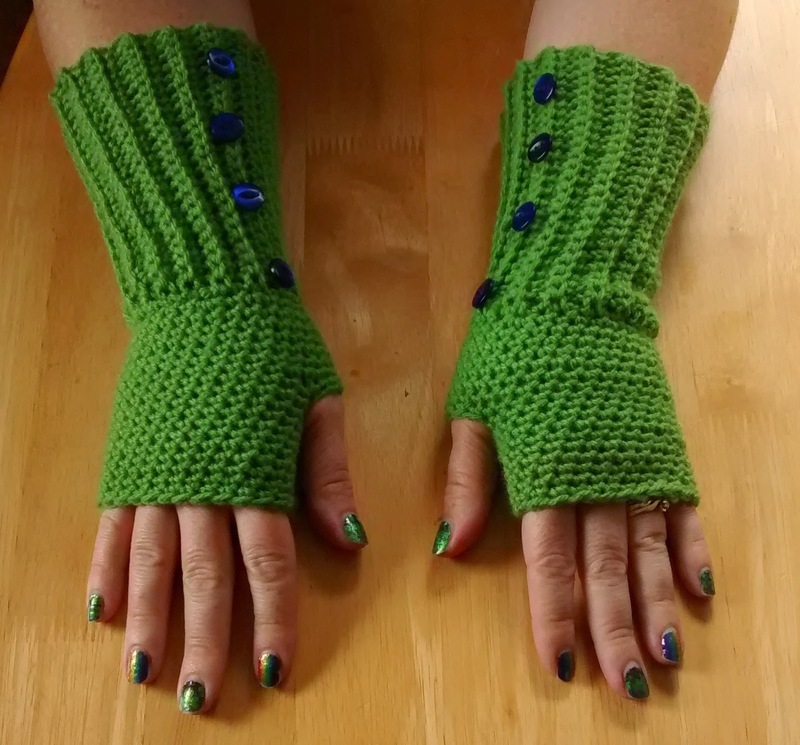 For this challenge I made myself some finger-less gloves. I've been meaning to make myself a pair for ages, so figured this was a good opportunity - especially with winter creeping up. And yes, I seem to have gotten stuck on the green theme. And that brings us to Challenge #7 - "D" is for. I'll give you a hint... it's something to do with dancing. You'll have to wait for reveal day which is officially April 14th, but for those of us in the NZ time zone it's not until the 15th.